There are seven separate Celtic nations, all of which are connected to one another by common history and culture. 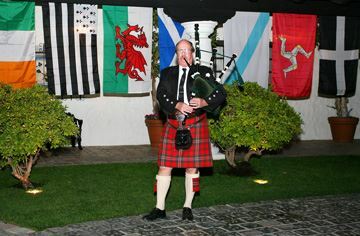 These seven nations are Wales, Scotland, Ireland, the Isle of Man (if your ancestors are from Man, your dues are waived for the first year), Galicia (in Spain), Brittany (in France), and Cornwall (in England). The Celtic people are known for their outgoing nature and their love of the written and spoken word. Not surprisingly, many descendants of Celtic immigrants have entered the legal profession. While there are many Irish-American lawers' groups in major cities in the United States, we believe the CBA is the first attempt to gather all the Celtic clans in a single legal organization. We meet on the third Tuesday of each month at Muldoon’s Irish Pub, from 5:30 p.m. to 9:00 p.m., through the graciousness of one of our founding members, Ronald O’Schwartz, located near Fashion Island at 202 Newport Center Drive. (949-640-4110). Business meetings are limited to five minutes (or it’s off with your head! ), along with complimentary hors d’oeuvres. Each year, we install our officers and recognize our Celtic Judge of the Year on Samhain Eve, which heralds the beginning of the Celtic New Year. According to the Celtic calendar, the year was divided into four quarters: Samhain (winter), Imbolc (spring), Beltane (summer), and Lughnasadh (autumn). In Ireland, it is pronounced "sow-in." In Wales and England, it is "sow-een." And in Scotland, because the Scots love to be different, it is "sav-en." Past recipients of the Judge of the Year award have included Justice Kathleen O’Leary, Judge William McDonald, Judge C. Robert Jameson. Judge David Mc Eachen, Judge Ronald Kreber, Judge Franz Miller, Judge Michael Brenner and Judge Dan Pratt. 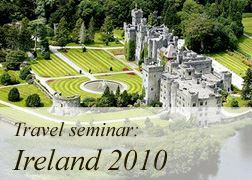 We have organized travel seminars to Ireland, Galacia, Scotland, Brittany and, most recently, Wales. We have also had excursions to the contemporary Irish comedies Stella by Starlight, Many Happy Returns and Verdi Girls at the Laguna Playhouse, Riverdance at the Orange County Performing Arts Center, and Irish and Celtic movies. Guest speakers at our events have included Kerry Kennedy Cuomo, human rights activist and daughter of Robert Kennedy, the prominent Irish playwright Bernard Farrell, and our own Judge William McDonald. Many lawyers and judges have rallied to our cause. We would like to have you come aboard as well. For further information about membership, please contact us here.